Music filled the air in Aalfs Auditorium Sunday night as the USD concert, chamber and mixed choirs combined for the fall choral showcase. 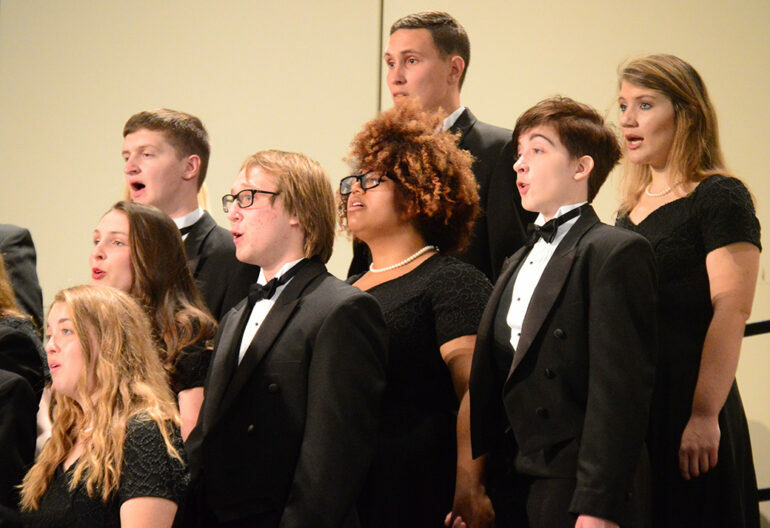 The men’s and women’s choir, directed by assistant professor of voice and choir Tim Campbell, consists of 80 students and community members. They sang everything from Bach’s “Chorale from Cantana 80, Ein feste Burg” to “True Light” by Keith Hampton. The concert choir followed with “In Virtute Tua,” accompanied by Rawlins trio violinist professor Ioana Galu and concertmaster of the USD symphony orchestra Shengho Wang, along with Rawlins trio cellist Rebecca Zimmerman. They sang a couple more songs and finished with “Loch Lomond,” where junior Seth Brick performed a solo. Campbell said the performance was a night of connection.